We are HUGE calligraphy fans here at Sweet Paper. So when Laura Hooper, one of our favorite calligraphers, launched a stationery line we couldn’t wait to get it in the shop. 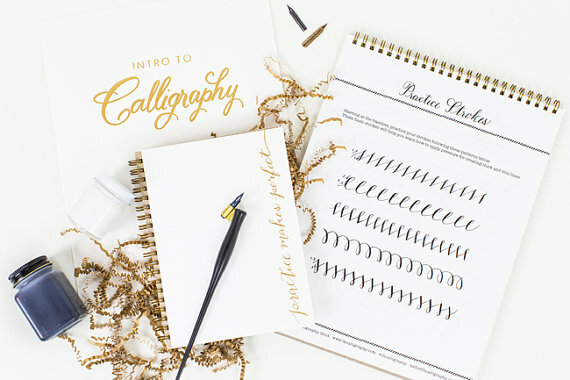 One of my favorite items is Laura’s Calligraphy Starter Kit. Now we can all learn how to write beautifully! Laura Hooper’s Calligraphy Starter Kit includes an oblique pen holder, 3 nibs, black and white inks, instructional tips and techniques book, gold foil practice journal, 3 alphabets, 3 sheets of vellum tracing paper and 3 sheets of gridline practice paper. Available in the shop and online!